In our new (Pella, of course) side door we have a “pebbled” window. 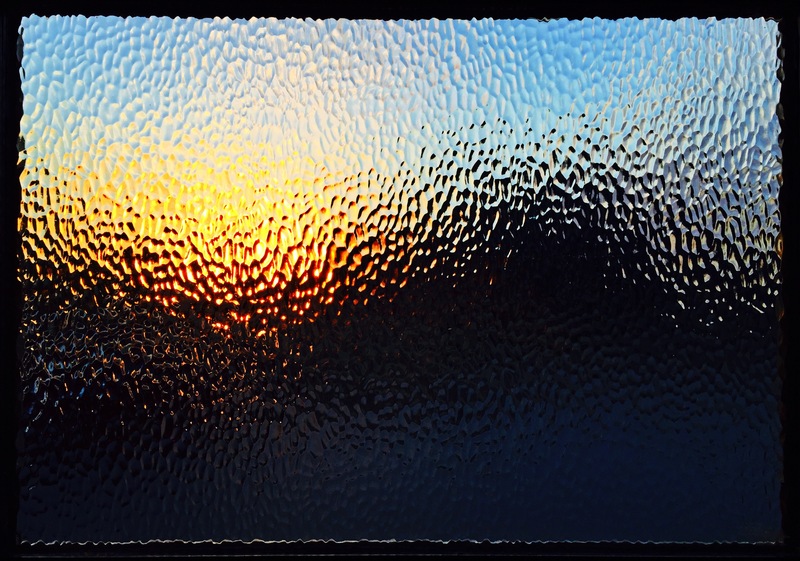 Last night as I looked down the dark hallway I caught this gorgeous impressionist vision of sunset. Couldn’t help but take a photo of it. Just last week I read a story about a legal dispute in which recording artists Pharrell Williams and Robin Thicke were sued by the family of Marvin Gaye. The family of the late soul legend claimed that Williams and Thicke stole elements of their father’s copyrighted song Got to Give it Up for their song Blurred Lines. In the end, a jury awarded the Gaye family $7.4 million dollars. Copyrights are a big deal. When a book is written, a song produced, or a movie is distributed there are laws designed to protect the writers, artists, and producers. In our internet age in which things can be produced and distributed across the globe with a click, disputes over who created something and who has the rights to this or that get messy. The legalities get even messier when you include individuals and their lawyers from different nations. I thought of this as I read this morning’s chapter in which God accuses Egypt of spiritual copyright infringement. The Egyptian pharaohs had a long history of claiming themselves to be deities. To claim that you were a god was a common way for ancient rulers to elevate themselves as authorities over their constituents. In his proud claim of divinity, it seems that Pharaoh took credit for creating the Nile. Creator God took note of the copyright infringement and the next couple of chapters stand as His summary judgement. It’s easy to think of Pharaoh’s pride as a relic of ancient monarchs. I have observed, however, that we live in a scientific, techno-industrial age in which God is summarily dismissed as non-existent. We are asked, instead, to place our faith in scientific theories presented as indisputable truth. In the absence of an almighty God before whom we are to be humble, we are free to feel a sense of creative pride in the babies we make and genetically engineer in our laboratory. We are free to take personal responsibility and/or credit for healing disease, being a well-spring of hope, or bringing salvation in various forms to people, relationships, our environment, city, region, state, nation, planet, or universe. I often wonder if we haven’t simply engineered a more subtle and spiritually insidious form of Pharaoh’s ancient copyright infringement. Each year our little town of Pella, Iowa celebrates its Dutch heritage with the annual Tulip Time festival. At the core of this traditional celebration is the election of our Tulip Queen and her court (Our daughter, Madison, was a finalist in the contest back in her day). Our dear friend, Megan, is on the court this year, and so Wendy and I headed out last night to a packed community center auditorium to watch the Queen and her court perform the program that they will take on the road to promote our town, our festival, our heritage, (and our local businesses!). I’m not sure that most residents in our town appreciate the way this annual tradition taps into some of the deepest sentiments of Dutch heritage. 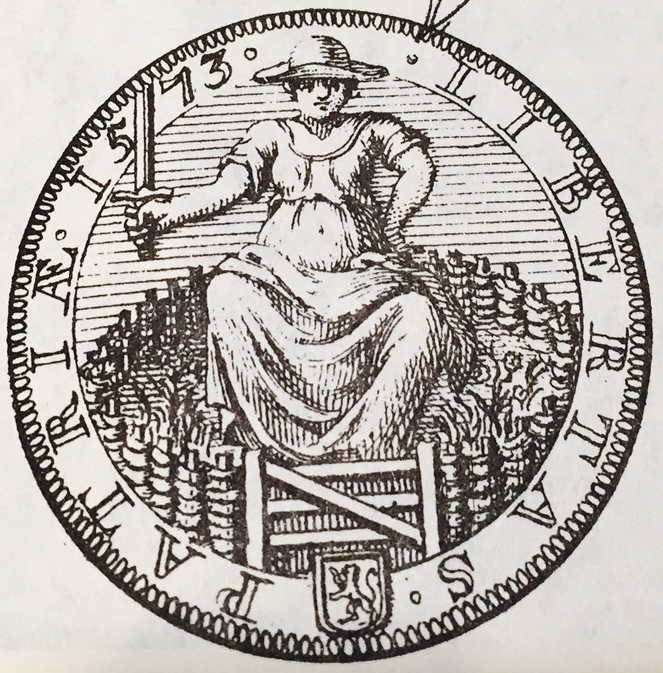 As the young republic of the Netherlands fought its revolt against Spain, one of the most powerful national patriotic metaphors emerged out of the deep sentiment the Dutch held for hearth and home: the Hollandse Maagd (Dutch Maid). 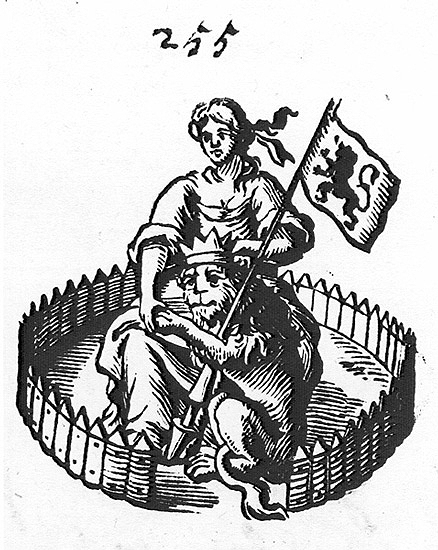 Young, beautiful, and verdant, the Dutch Maid appeared with the rampant lion amidst her small fortress symbolizing the small republics small fortress state set amidst the sea and her enemies. 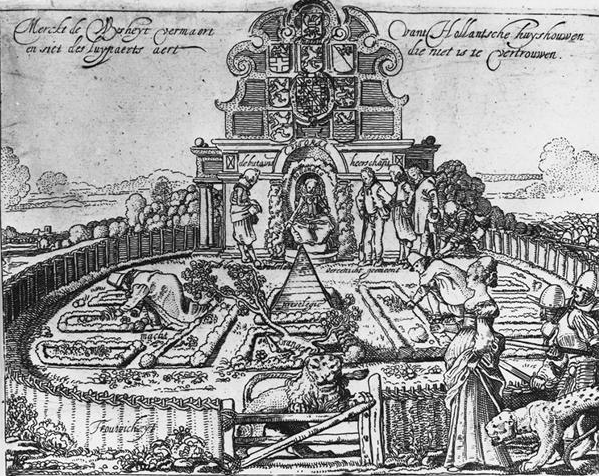 Later, the Dutch Maid’s fortress became a lush garden of prosperity over which she was enthroned. The Dutch Maid even found her place on Dutch currency. I enjoyed watching last night as our local Hollandse Maagds paraded out in traditional Gronigen costume, complete with Dutch hat. The Tulip Queen and her court will metaphorically preside over our prosperous tulip gardens, lead our parades, honor our traditions, and promote our local commerce. All five of them truly are amazing, beautiful, intelligent, and talented young ladies. And, I realized last night, whether they know it or not these young ladies embody a metaphor that is more deeply entrenched in our heritage and speaks more deeply to our community psyche than most of us know or can possibly imagine. Reading the newspaper (the actual paper and ink newspaper) is a old school habit that has become a little luxury for Wendy and me. Growing up as a “Paperboy,” I learned early in life to enjoy taking a few minutes each day to read through the news. I long ago grew tired of the way our regional newspaper, The Des Moines Register, became little more than a giant circular advertisement with regurgitation of syndicated content from the AP wires. Wendy and I subscribe to the Wall Street Journal and enjoy reading and discussing the news of the day with our breakfast each morning. One of the things Wendy and I have come to observe about “the Journal” is the laughable way that economic indicators grab headlines. 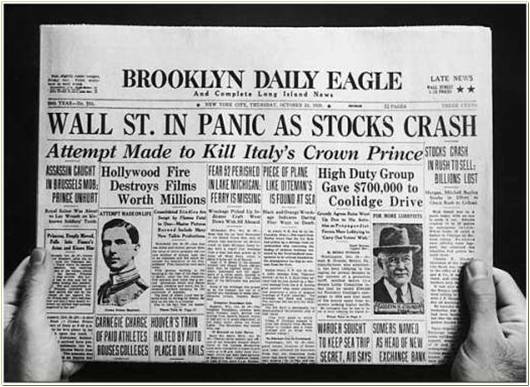 One day the front page signals that we’re back to the economic glory days of the Roaring ’20s and the next day the headlines scream that we’re teetering on the brink of another Great Depression. There is little doubt that the paper caters to its core constituency of business and investors who tend to look at everything in life through the lens of commerce. In today’s chapter, Ezekiel continues his prophetic message of doom for the ancient city-state of Tyre. The prophecy, however, takes a sudden turn worthy of a front page mention on the Wall Street Papyrus of their day. Ezekiel, whose prophetic messages centered around religion and idolatry, turns his prophetic lens on Tyre’s economy. Situated on the Mediterranean coast, Tyre was an important harbor of trade back in that day. Ships from northern Africa, Greece, and southern Europe regularly sailed in and out of Tyre. The trading ships of Tyre had a strong reputation. Ezekiel, however, prophesies that their ships and their economy are about to sink. My high school history teacher once told us that if we really wanted to find out what is really going on in the world we should “follow the money trail.” I have never forgotten it, and have found it sage advice. Greed is a powerful force, and economics regularly gets the better of our strongest moral principles and religious virtues. Ezekiel’s message in today’s chapter seems to tap into that knowledge of the human condition. Business often scoffs at religion and politics. 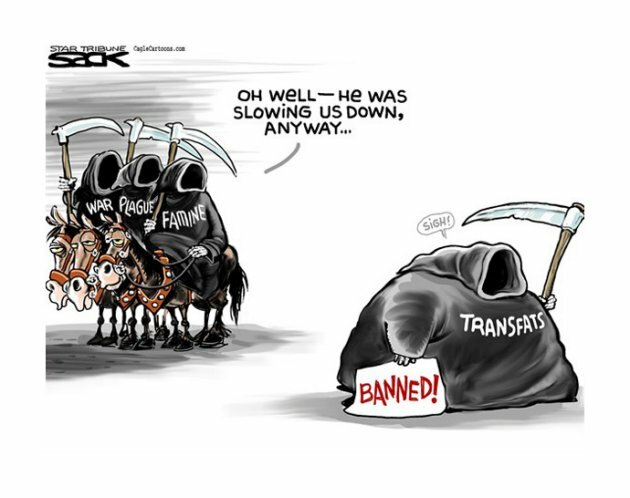 Commerce seems to think that it will always find a way to escape and make a buck off the suckers in the world. If you want to strike fear into the heart of the business class simply threaten their bank account. Which is exactly what Ezekiel was doing. There’s no getting around the fact that the messages of the prophets were and are, by and large, depressing. Doom, gloom and judgement are a tough assignment to continuously deliver. I’ll admit that we’ve only made a little more than half way through Zeke’s anthology of prophetic messages and I’m already looking at the calendar with an eye to when we’ll be through it. I have been finding some fascinating stuff in it, but it’s hard to read day after day and not want for a little positive reinforcement. Which, as I ruminate on it this morning, I believe is part of the point. The doomsday messages of the prophets is set on the timeline of history 400-800 years before the birth of Jesus. When the prophet Malachi ended his prophetic messages c. 430 B.C. there was a long silence until the angel Gabriel broke the news to Mary that she was pregnant. And, with that message doom began to give way to hope and salvation. That Message of hope and salvation embodied in Jesus stands in stark contrast to the messages of doom and judgement of the prophets. I find it interesting that Ezekiel’s message in today’s chapter is of being lost and never found, while Jesus’ messages were consistently about finding that which was lost. Jesus preached of finding lost sheep, lost coins, and lost children. On this life journey we experience different times and seasons. We may journey through difficult stretches in which our own foolishness, rebellion, and hard hearted choices consequentially result in having to plod along difficult paths. Feeling lost and hopeless are not unique to the human experience, and there are times when we can identify with the prophets doom and gloom. Jesus was sent, however, to show us The Way that leads to Life for any who has faith to ask, seek, knock, and follow. Wendy and I had an enjoyable couple of days at the lake last week. We drove down on Thursday morning and came back Saturday night. Quick trip, but it was nice to get away from what has been the normal routine for a short while. We watched the Iowa State vs. UAB game from Buffalo Wild Wings in Osage Beach over lunch on Thursday and were disappointed, like the rest of Cyclone nation, with the outcome. We worked remotely the rest of the day on Thursday and into Thursday evening. Also worked most of Friday, but took the opportunity to get things ready for the coming summer and take care of stocking up. The lake level was as low as we’ve ever seen it. I tried to lower the boat into the water, but the lift dropped about six inches and sat on the bottom. So, no boat rides this past weekend. Friday was a day of celestial events. It was the spring equinox, as well as there being an eclipse of the sun and a giant moon. 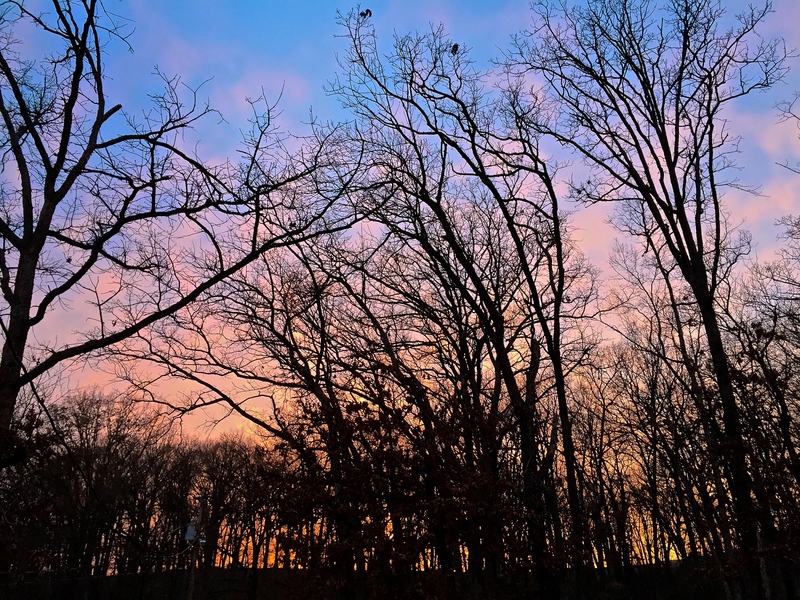 I don’t know if any of these events had anything to do with the sky in Missouri, but Wendy and stepped out on Friday evening to see an eerie red glow. The sky was as deep scarlet as I’ve ever seen it in my life. I took the photo above from our back porch looking out at the western sky through the tree line. Gorgeous. It reminded me of the old saying, “Red sky at night, sailor’s delight.” It was delightful. We got home Saturday evening. Unfortunately I had been working on coming down with symptoms of a cold. Cough, congestion, and waves of weariness. We went to church yesterday, but rested most of the day in an effort to try and ward off things getting any worse. Now, for another work week.